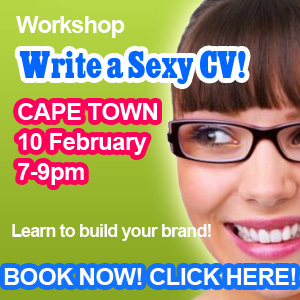 Okay, so after much thought I’ve decided the feedback from the IOL column on how to improve your brand with a good looking CV has been so overwhelming, it certainly requires a few workshops to help people design and develop their personal marketing tools. Our first workshop will be in Cape Town on the 10th of Feb. With more to follow in other cities. Cost of the workshop will be R350, and will include refreshments and a cool CD-ROM with all your tips and guidelines on how to build your marketing plan for success in your career. Importantly also, on how to design your CV. This 2 hour (7-9pm) workshop is sure to be fun and fast paced. If you would like to book for this workshop, please EMAIL here, or click on DAREDREAMDONE.COM.